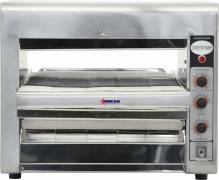 A conveyor oven in your food establishment gets the job done faster, without having to waste valuable oven space on small individual items! Perfect to add to your buffet line, to allow for self-service, or for your café or restaurant to offer fast production with minimal effort! A much better option than a toaster, as an impinge oven allows for a more versatile production of food products! Skip steps, by being able to cook all the ingredients using only one conveyor oven! A conveyor oven allows you to melt the cheese while toasting the bread!